The current model of out-patient fracture care is outdated. A massive investment would be required to maintain the status quo. The structure of the medical workforce and training has changed, with less reliance on direct patient care provided by doctors in training. Strategies such as the NHS Scotland Workforce 2020 programme recognise this. Modern literature has suggested that pathway redesign in orthopaedic trauma is safe and effective. It has also reported on the outcome of many stable, minor injuries that can be treated with early mobilisation and “self-care”, with the back-up of the orthopaedic department when recovery deviates from the expected path. 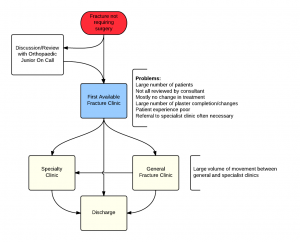 This redesign process examined all the processes in the out-patient care of orthopaedic trauma. It attempted to implement safe and effective processes that were rooted in the evidence base, rather than bias and belief. 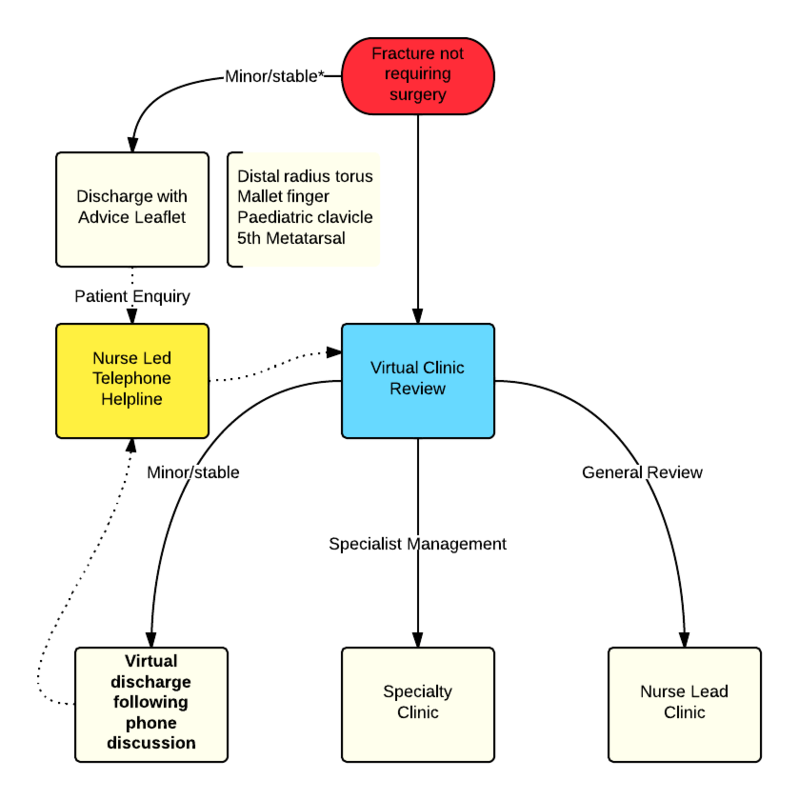 The aim of this website is to share the redesign process that has taken place in the Fracture Clinic at Glasgow Royal Infirmary (View webcast summary of process). The traditional model of out-patient management of fractures consists of early review of all injuries.This approach has not recognised our increased understanding of the natural history of many stable injury patterns. It also does not recognise the changes in the healthcare team, with many roles now being effectively delivered by non-medical staff.It often results in needless attendances at hospital, with no apparent change in management. We have undertaken an evolutionary approach to this problem. This involved analysis of the traditional process and design of a new safe, timely and effective process. It required the implementation of multidisciplinary team and the establishment of close links with our associated emergency and minor injuries units. The following map shows the units that have either fully implemented the principles of Fracture Clinic Redesign (Green), or have introduced the leaflets in the ED (amber). Other units have visited Glasgow Royal Infirmary and are planning a redesign (dark blue) while others have made initial enquiries (fuschia).